"MbZ" redirects here. For other uses of the initials MBZ, see MBZ. H.H Sheikh Mohamed bin Zayed bin Sultan Al-Nahyan (Arabic: محمد بن زايد بن سلطان آل نهيان‎; born 11 March 1961), commonly known as MBZ or MbZ, is the Crown Prince of Abu Dhabi and Deputy Supreme Commander of the UAE's Armed Forces. He is seen as the driving force behind the UAE's activist foreign policy and is a leader of a campaign against Islamist movements in Arabia. Due to the ill health of the UAE president Sheikh Khalifa bin Zayed, Mohamed bin Zayed assumed most of the presidential duties as the Abu Dhabi crown prince and hence, he is sometimes considered as the UAE’s de facto ruler. Mohamed bin Zayed Al-Nahyan was born on 11 March 1961. He is the third son of Zayed bin Sultan Al Nahyan, the first President of the United Arab Emirates and ruler of Abu Dhabi, and his third wife, Sheikha Fatima bint Mubarak Al Ketbi. He has five younger full-brothers: Hamdan, Hazza, Tahnoun, Mansour, and Abdullah. They are known as Bani Fatima or sons of Fatima. In November 2003, his father Sheikh Zayed bin Sultan appointed Sheikh Mohamed as Deputy Crown Prince of Abu Dhabi. Upon the death of his father, Al-Nayhan became Crown Prince of Abu Dhabi in November 2004 and was appointed Deputy Supreme Commander of the UAE Armed Forces in January 2005. Later that month, he was promoted to the rank of General. Since December 2004 he has also been the Chairman of the Abu Dhabi Executive Council, which is responsible for the development and planning of the Emirate of Abu Dhabi and is a member of the Supreme Petroleum Council. He also serves as a special adviser to the President of the UAE, Khalifa bin Zayed Al-Nahyan, his older brother. He is also head of the Abu Dhabi council for economic development (ADCED), which is the economic policy advisory council in Abu Dhabi. Al-Nahyan is also the head of the Mubadala Development Company which, since its establishment in 2002, represents the main investment vehicle for the government of Abu Dhabi. Al-Nahyan is also a Director of the Abu Dhabi Investment Authority, the Sovereign wealth fund of Abu Dhabi. In addition, he is the head of the UAE offsets programme bureau and is the head of the Abu Dhabi Education Council which was established in 2005. His efforts in the realm of economic development are aimed at increasing economic diversification in the Emirate of Abu Dhabi. As the head of the UAE offsets group, Al-Nahyan is involved with the task of channelling defence-related investments into profitable projects across different sectors in order to help diversify the economy of the UAE. In 2008, the first group of Sheikh Mohamed bin Zayed University scholars were selected as part of an initiative with New York University Abu Dhabi, recognising outstanding students in the United Arab Emirates and providing them with special academic and leadership opportunities. June 2009 saw Al-Nayhan and then President Nicolas Sarkozy of France inaugurate an exhibition at the Emirates Palace Hotel, which included works of art purchased for the Louvre Abu Dhabi, as well as loans from the French national museums to mark the beginning of the construction work of the Louvre outpost, located in the cultural district in Saadiyat Island. Al-Nayhan also stated that he was confident that the Guggenheim Abu Dhabi would be able to "accumulate a prestigious art collection" by the time of its opening in 2012. In November 2010, Al-Nayhan and UAE Foreign Minister Abdullah bin Zayed Al Nahyan welcomed Queen Elizabeth II of the United Kingdom and Prince Philip, Duke of Edinburgh to the UAE for their second state visit. Al-Nahyan also accompanied the Queen and the Duke on a tour of the Sheikh Zayed Grand Mosque at the beginning of their visit. In January 2011, Al-Nahyan received US Secretary of State Hillary Clinton. An American citizen Khaled Hassen won a rare $10 million torture settlement granted by federal court in L.A., against three top members of the ruling family in the United Arab Emirates, including Mohamed bin Zayed Al Nahyan, after State Department cables proved the man had indeed been detained and tortured as he had claimed. He represented the United Arab Emirates in the Nuclear Security Summit of 2012 and 2014, which were hosted by South Korea and the Netherlands respectively. 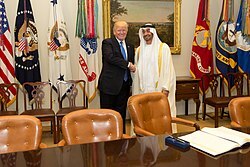 In August 2016, Donald Trump Jr. had a meeting with envoy representing Mohamed bin Zayed Al Nahyan and Saudi Arabia's Crown Prince Mohammad bin Salman. The envoy offered help to the Trump presidential campaign. The meeting included Joel Zamel, an Israeli specialist in social media manipulation, and American businessman Erik Prince. Dubai based political advisor to Mohammed bin Zayed Al Nahyan hinted at bin Zayed’s involvement in sacking of Rex Tillerson from the position of US Secretary of State in March 2018. A source close to Hamad al Mazroui, Zayed's de facto head of intelligence, said Mohammed bin Zayed was also gloating about Tillerson’s firing. Later, in August 2018, involvement of Mohammed bin Zayed al Nahyan in a failed invasion of Qatar in June'17 was highlighted. The invasion didn't succeed as it was meddled by Tillerson days before it was supposed to take place. In 2017, the Government of India Invited Sheikh Mohamed as Chief Guest for the 68th Republic Day Celebration on 26 January 2017. Al-Nahyan is one of the significant members of the Saudi-led, western-backed coalition fighting in Yemen to drive out Houthi militants since 2015. During Mohammed bin Zayed visit to France in November 2018, a group of rights activists filed a lawsuit against the crown prince accusing him of war crimes and complicity in torture and inhumane treatment in Yemen. Mohammed Bin Zayed heads the Mohamed bin Zayed Species Conservation Fund, a philanthropic endowment established to provide targeted grants to individual species conservation initiatives, recognise leaders in the field of species conservation and elevate the importance of species in the broader conservation debate. A species of woodlizard--Enyalioides binzayedi—was named after him as the creator of the Mohamed bin Zayed Species Conservation Fund that provided financial support to the expeditions leading to the discovery of the specie in the Cordillera Azul National Park in Peru. In 2017, a rare and majestic specie of maple tree was named after him. Acer binzayedii is found in the mountainous cloud forest of Jalisco in Western México. In 2011, Al-Nahyan and the Gates Foundation pledged $50 million each to fund the purchase and delivery of vaccines for children in Afghanistan and Pakistan. Mohammed bin Zayed is married to Sheikha Salama bint Hamdan bin Mohammed Al Nahyan. They married in 1981. They have nine children. ^ Ulrichsen, Kristian Coates (1 December 2016). The United Arab Emirates: Power, Politics and Policy-Making. Taylor & Francis. ISBN 9781317603108. ^ Rhodes, Ben (12 October 2018). "A Fatal Abandonment of American Leadership". The Atlantic. Retrieved 13 October 2018. ^ "The ambitious United Arab Emirates". The Economist. 6 April 2017. Retrieved 11 April 2017. ^ "Despots are pushing the Arab world to become more secular". The Economist. 2 November 2017. ^ "H.H. Sheikh Mohamed bin Zayed Al Nahyan". Retrieved 16 April 2013. ^ a b "With MBZ's promotion, Sheikha Fatima sons take centre stage". Gulf States Newsletter. 724. 12 November 2003. Retrieved 16 April 2013. ^ Davidson, Christopher M. (29 November 2009). "A tale of two desert dynasties". The Telegraph. Retrieved 16 April 2013. ^ "UAE Succession Update: The Post-Zayed Scenario". Wikileaks. 28 September 2004. Retrieved 16 April 2013. ^ "Abu Dhabi's family business". Financial Times. 5 May 2009. Retrieved 16 April 2013. ^ Bruce Maddy-Weitzman (1 August 2002). Middle East Contemporary Survey: 1999. The Moshe Dayan Center. p. 629. ISBN 978-965-224-049-1. Retrieved 16 April 2013. ^ "Abu Dhabi National Oil Company (ADNOC) - The Supreme Petroleum Council (SPC)". ADNOC. 25 June 2011. Archived from the original on 27 February 2010. Retrieved 11 April 2013. ^ "First group selected as Sheikh Mohamed bin Zayed University scholars". AMEinfo. Archived from the original on 8 January 2009. Retrieved 23 July 2008. ^ Nadia Ptashchenko (8 July 2009). Art Mobility Between Museums in Europe: A Case Study of the Hermitage Amsterdam and the Guggenheim Bilbao. GRIN Verlag. p. 101. ISBN 978-3-640-36824-2. Retrieved 21 March 2012. ^ Mitya Underwood (13 November 2012). "Sheikh Mohamed welcomes back old friends to capital". The National. Retrieved 11 April 2013. ^ "The Leading Mohammed bin Zayed Site on the Net". Mohammed bin Zayed. Retrieved 11 April 2013. ^ "State Department cables show settlement of torture victim case". The Intercept. 6 June 2017. Retrieved 1 July 2017. ^ "World leaders gather for Seoul Nuclear Security Summit". ArabianBusiness.com. Retrieved 27 November 2018. 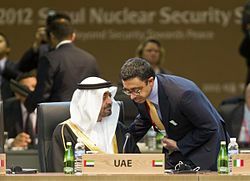 ^ "Safety moves welcomed by Sheikh Mohammed bin Zayed as nuclear summit concludes". The National. Retrieved 27 November 2018. ^ "Saudi crown prince boasts HE got Rex Tillerson fired after telling Jared secretary of state had to go - and second Gulf royal close to Kushner makes the SAME claim". Daily Mail. 21 March 2018. Retrieved 21 March 2018. ^ "Saudi Arabia planned to invade Qatar last summer. Rex Tillerson's efforts to stop it may have cost him his job". The Intercept. August 2018. Retrieved 1 August 2018. ^ "Saudi-led coalition strikes back after deadly Houthi attack". CNN. Retrieved 6 September 2015. ^ Jarry, Emmanuel. "Rights group sues Abu Dhabi Crown Prince in France over Yemen". U.S. Retrieved 27 November 2018. ^ Vargas-Rodriguez, Yalma L.; Urbatsch, Lowell E.; Karaman-Castro, Vesna; Figueroa-Rangel, Blanca L. (1 June 2017). "Acer binzayedii (Sapindaceae), a new maple species from Mexico". Brittonia. 69 (2): 246–252. doi:10.1007/s12228-017-9465-5. ISSN 0007-196X. ^ "Gates Foundation, Sheikh Mohammed bin Zayed Al Nahyan Pledge $100 Million for Disease Prevention". Philanthropy News Digest. 27 January 2011. Retrieved 22 February 2012. ^ "Shaikha Fatima receives female diplomats". Khaleej Times. 10 August 2011. Retrieved 16 April 2013. ^ Barlow, Tom (6 April 2011). "The Most Extravagant Weddings". Forbes. Retrieved 18 April 2013. ^ a b c d e f g h "Crown Prince Court Awards and Honors". Crown Prince Court. ^ "Boletín Oficial del Estado" (PDF). ^ Maroc. ma (17 March 2015). "SM le Roi et SA Cheikh Mohammed Ben Zayed Al-Nahyane président la cérémonie de signature de plusieurs accords de coopération bilatérale". This page was last edited on 22 April 2019, at 14:12 (UTC).